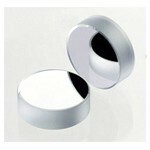 Mirrors are a critical and commonly used component in many optical systems. We are manufacturing our mirrors with excellent surface figure, accurate surface quality and best coating specification. We carry on stock 5 ranges of flat quality mirrors, including metal mirrors, Nd Yag mirrors, Ultrafast mirrors, Broadband dielectric and sputtered mirrors. This is the most popular mirror offering for experiment and industry applications. We answer to all other requests on demand.